The FamiLee Jewels: Yes we do teach classes! Yes we do teach classes! The FamiLee Jewels are frequently asked if we teach the techniques that we use to make our jewelry. The answer is: Yes! We do teach classes through a home party system. You can host a class in your home or mine. We teach a minimum of 4 adult students per 2 hour class. The maximum would be 10 students. The price is $20 per person for the lesson and the supply fee depends on the technique being taught. We teach beginner classes for those that have never tried jewelry making and project classes for those with some experience. We provide tools, beads, and findings. Basic bead stringing. supply fee $5.00. This is a perfect class for those with no jewelry making experience or for those just looking for a fun way to spend a couple of hours using your creative spirit. The student will make a necklace and pair of earrings. She will learn the techniques of stringing on beading wire, crimping and simple loops. Multi-strand necklaces. supply fee $10.00. 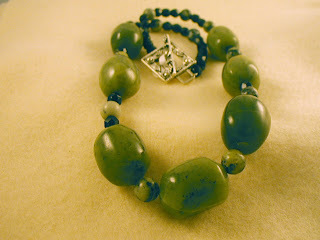 This class is great for people with some jewelry making experience. It explores the different means of attaching multiple strands of beads. The student will make a multi strand necklace and pair of double drop earrings. She will learn the above techniques and the additional skills of wrapped loops and using multi strand findings. Memory wire. supply fee $10.00. This class will introduce the student to the wonders of memory wire. This specialty wire has been manufactured in a way that it keeps it's coiled shape allowing the user to create jewelry that does not require clasps. The student will make a multiple loop memory wire bracelet with charm end, and a memory wire necklace. She will learn the techniques of simple loops and working with memory wire. This class explores the many style of simple earrings. The student will make 5 pair of earrings including drop earrings, double drop earrings and hoop earrings. She will learn the techniques of simple loops, wrapped loops and working with jump rings. Ankle bracelets. supply fee $10.00. A great class for girls night out or the beginning of summer, paint your toenails and make a sassy new ankle bracelet for spring. The student will make 2 ankle bracelets one beaded, one chain. She will learn the techniques of wrapped loops, bead stringing with beading wire, crimping, and working with jump rings. Chandelier earrings. supply fee $12.00. This class explores the possibilities of chandelier earrings from delicate to Bollywood, there is something for everyone. The student will make 2 pair of chandelier earrings using her choice of styles. She will learn the techniques of simple loops and wrapped loops. This is a great class for those that enjoy fashion watches. The student will make 3 easily interchangeable bands for the same watch face. She will learn the techniques of bead stringing with beading wire, crimping, wrapped loops and working with jump rings. A fast, fun class to make simple bead and wire rings. The student will make a simple bead ring, a wire spiral ring, and a wire heart ring. She will learn simple wire wrap techniques. Charm bracelets. supply fee 10.00. This class teaches the basics of making a fashionable bead charm bracelet. The student will learn the techniques of wrapped loops and working with jump rings. For those that are drawn to working with wire. The student will learn how to wrap a cabochon, and make a cord necklace to hang it on. 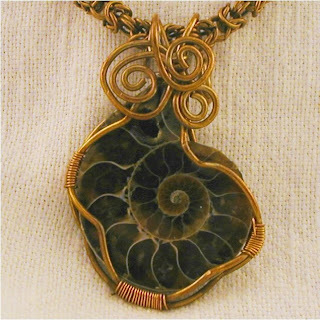 Once you have mastered the basic wire wrap this class will teach you how to embellish your work with loops, swirls and multiple wires. We bring all necessary supplies, samples of our work and also offer a selection of kits and tools for sale so that people can continue to make jewelry once class is over. To book a class or discuss the possibilities contact Bonnie@TheFamiLeeJewels.com . well thanks. I want to join one. Cassie Your necklaces are ready!!! !